Florence Blamed For 4 More Deaths As 'Unheard Of Amounts Of Water' Keep Flowing The additional deaths were reported in North Carolina. South Carolina's governor said the damage in his state "will be catastrophic, surpassing anything recorded in modern history." 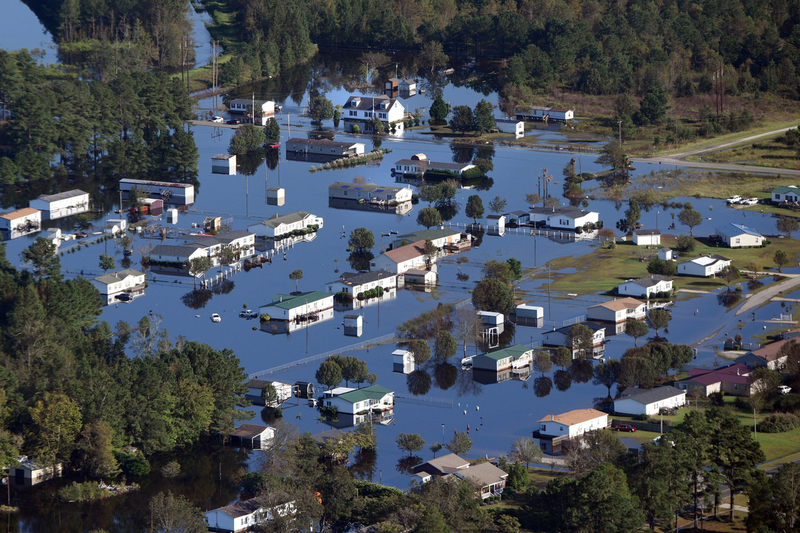 Aerial views of flooding and submerged homes in Lumberton, N.C., on Thursday. 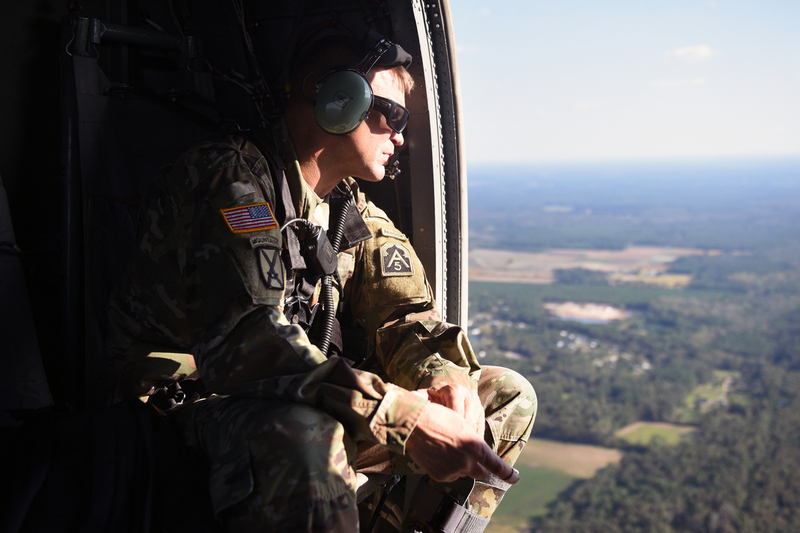 Lt. Gen. Jeffrey Buchanan surveys flooding and damage from Hurricane Florence during a helicopter ride from Raleigh to Wilmington, N.C., on Wednesday. Buchanan also assisted after Hurricane Maria in Puerto Rico. The state's Department of Public Safety said four more deaths were reported in Duplin County, without providing further details, reports The Associated Press. "Major flooding is still occurring across many of our rivers," North Carolina Gov. Roy Cooper said at a Thursday news conference. Even as he underscored the ongoing danger, he highlighted the tireless efforts of first responders. "More than 4,700 people have been saved, twice as many as in Matthew." 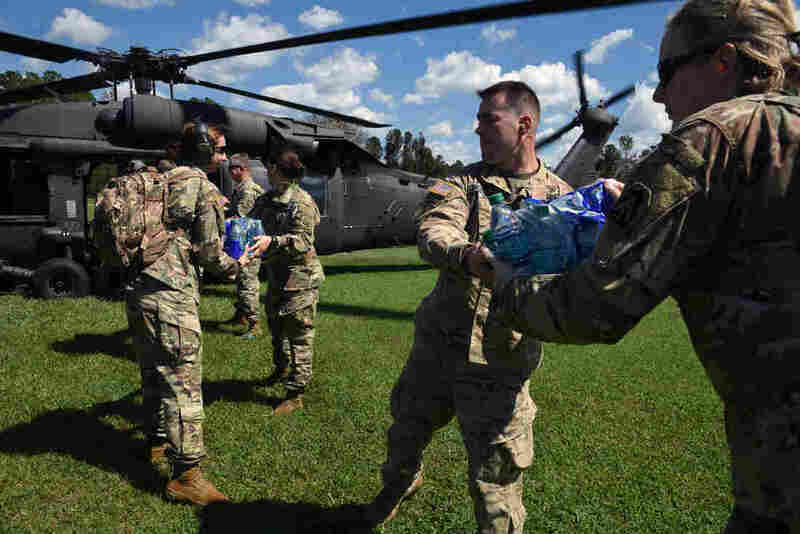 U.S. Army servicemen and women distribute water bottles and supplies. The National Weather Service reported flooding at 30 river gauges on Thursday, 12 of them major, mainly in North Carolina, but also in South Carolina and Virginia. Rivers at some sites are not forecast to crest for days, including near Conway, S.C., where President Trump visited Wednesday. "Over the next couple of days it's going to get rough in South Carolina," Trump told a crowd gathered at the Horry County Emergency Operations Center. Trump called Florence "one of the most powerful and devastating storms ever to hit our country." South Carolina Gov. Henry McMaster agrees. "The rainfall and flooding in North Carolina is sending unheard of amounts of water into South Carolina along the Lynches, Great Pee Dee, Little Pee Dee and Waccamaw rivers," McMaster wrote Thursday. "The damage in the northeastern part of our state will be catastrophic, surpassing anything recorded in modern history." 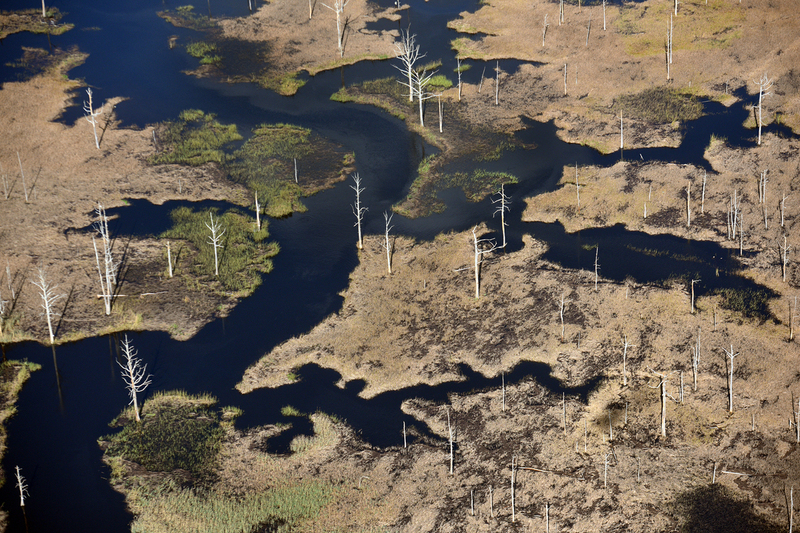 Aerial views of damage from Hurricane Florence in North Carolina. Residents of Georgetown County, S.C., have been told to have go-kits at the ready in case of evacuation. Georgetown," County Administrator Sel Hemingway tells ABC News. "Due to the fact that a lot of these rainfall levels were higher than historic levels, it made it harder to predict because you didn't have a benchmark to weigh that against." Officials are maintaining their plea for motorists to avoid areas still experiencing flooding. Even on seemingly safe roadways, vehicles can quickly be overcome. On Tuesday, a sheriff's van in Horry County, S.C., was swept away, killing two of its passengers on their way to receive mental health treatment. Most of the storm deaths have occurred in vehicles, reports the AP. Around 750 roads remained closed across North Carolina on Thursday, down from around 2,200, according to the state's Department of Transportation. "There are many roads where water levels will continue to rise making the roads impassable during the next 72 hours or more depending on when the local rivers crest," NCDOT said, adding that travel was not recommended in several counties, including Cumberland, Duplin and Harnett. Views of power workers in North Carolina. 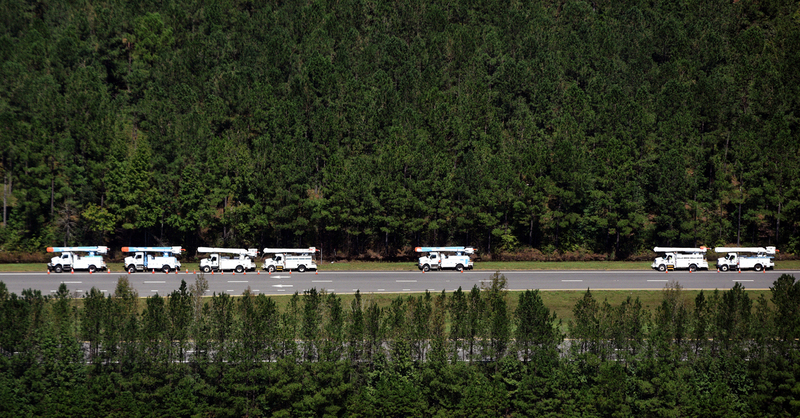 Duke Energy, the area's biggest utility, reported that tens of thousands of customers in North and South Carolina were still without power Thursday. Duke also raised an emergency alert Thursday after floodwaters from the Cape Fear River near Wilmington, N.C., spilled over a dike, threatening a retired coal-fired plant now used as a generating station run with natural gas, reports the AP. Over the weekend, Duke also said that flooding had resulted in toxic coal ash spill. On Wednesday, 7,800 residents remained in shelters across North Carolina. Chef Jose Andres, who helped feed Puerto Ricans devastated by Hurricane Maria, has been in North Carolina for days with his nonprofit World Central Kitchen. They have been serving up 20,000 meals a day to feed first responders as well as storm evacuees. As if the flooding were not enough, officials confirmed Thursday that Florence had spawned more than a dozen tornadoes, with more expected in the coming days. And in yet another miserable twist of nature, floating balls of fire ants have emerged, like the ones that plagued Harvey survivors in the Houston area. "The fire ants are doing their thing where they float and if you get close to them they will swim to you," Conway resident Debbie Long told South Carolina Public Radio. "I've already been bitten." But even as some residents remain in the grip of an ongoing disaster, officials are eyeing the road to recovery. Floodwaters have receded in some areas, allowing residents to return home to assess the damage. In an appeal for federal disaster recovery funds, McMaster announced Thursday that South Carolina's financial losses from the storm are estimated to top $1.2 billion. McMaster is asking for funding for half of the state's 46 counties. The preliminary breakdown includes losses and federal recovery fund estimates of $125 million for the state's agriculture industry and $165 million for the National Flood Insurance Program. Also Thursday, FEMA said it will speed up the process for storm victims to receive advance payments on their flood insurance claims. Policyholders can get up to $5,000 without an adjuster visit or providing additional documentation to their insurer, FEMA said. But if a policyholder provides photo or video evidence of damage and receipts of out-of-pocket expenses related to flood loss, up to $20,000 in advance payments will be available. 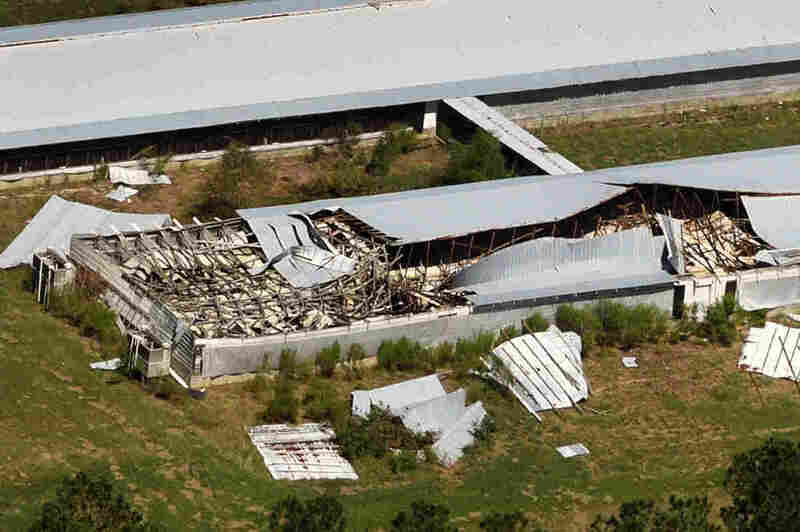 NPR's Ruben Kimmelman contributed to this report. A previous version of this story misspelled County Administrator Sel Hemingway's first name as Saul.